Here’s one of the footings we poured this week. 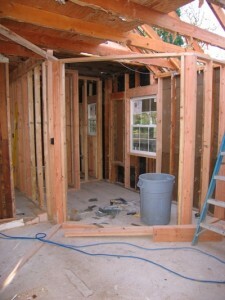 It is the ribbon footing that will support the load-bearing wall between the master bedroom and bath. 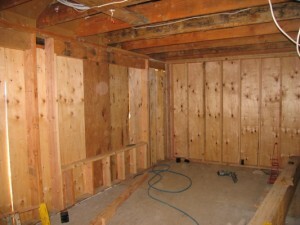 In remodeling, we often find ourselves in small spaces pouring new footings or enlarging existing ones. 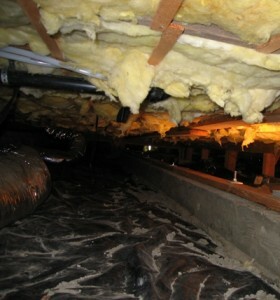 This crawlspace is nice and dry which is a sign of good drainage. While one crew was under the house, another crew was on top of the house. 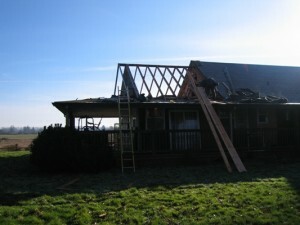 Our main project this week was to reframe part of the existing roof. 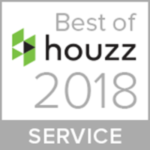 The existing roof had two different pitches, preventing the home from having a cohesive look. To remedy this situation we are leaving the existing undersized framing and stick framing a new roof system right next to the old one. Inside the house we have been busy hoisting beams- big beams. Below is a picture of the beam that will replace the wall between the family room and the new dining room (which was originally the laundry room). This is a Parallam and it took 5 guys to get it into place. 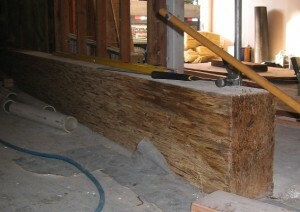 This is one of 3 large beams we have placed so far. The addition is progressing nicely. The exterior walls have been built and the framing for the windows is ready. Plywood covers the window openings to keep the weather and unwanted critters out. The electrical rough-in was underway when this picture was taken. Soon the walls will be adorned with electrical wire and electrical boxes. Here’s the upstairs bath as it looks this week. The beam has been placed and the rough plumbing has been installed. This bathroom was designed with all the homeowners’ children and grandchildren in mind. There will be plenty of counter space and mirror space so schedules won’t be thrown off when all the girls congregate here. Downstairs the Master suite is starting to take shape. 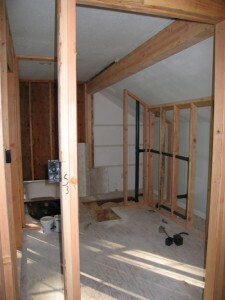 The walk-in closet and toilet room have been framed. 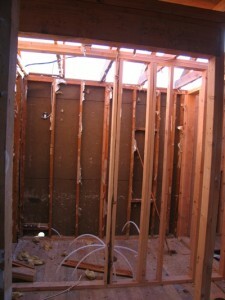 The angled wall, which will hold the see-through fireplace, will be framed once the tub has been moved into the room. 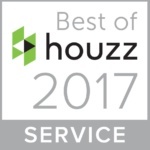 A window was planned in the master closet for ventilation and to keep the house’s curb appeal. Next week we will dry in the newly framed roof and prepare for drywall.